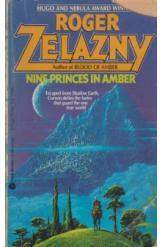 Nine Princes in Amber by Roger Zelazny, Sci Fi. Book is in good condition, all pages intact. The crown prince Corwin of Amber returns to his native world after a long exile. The other princes must be subjugated, and from between the worlds the demonic forces of Chaos rise as well. Part of the Amber series.